If the Batman’s daughter Huntress is smart enough to steal millions from Bruce Wayne, is it surprising that Batman’s son Robin can catch her out? Helena is appalled that this little snot is wearing ‘her’ colours and using ‘her’ name, whereas Damian is wondering why her fighting style is so familiar. Away from Gotham, Power Girl is piggybacking an energy detector onto a Galaxy Communications satellite. She’s hoping to find Apokolips waves of the kind attached to the monster she recently fought in Tokyo that may help Helena and herself return home to Earth 2 from Earth 1. The fight between the Wayne almost-siblings makes for an amusing central conceit to Paul Levitz’s engrossing tale. I’m surprised at how free Helena is with hints as to just who she is – she already knows Damian is ‘Not-Dad’s’ son – but surprise is good. As is the dialogue – I can’t recall if Levitz has written Damian previously, but he should certainly write him again, superbly capturing the assassin prince’s haughtiness. Wish granted – at issue’s close, Levitz sets up a new mystery that ensures a team-up between Huntress, Power Girl and Damian next month. Sharing the art duties, as ever, are George Perez and Kevin Maguire; veterans they may be, but there’s a tyro energy to their work, a joie de vivre in slam-bang superheroics that does them credit. The former handles the Power Girl solo sequences while the latter gives great Gotham. Perez’s partner is inker Sandra Hope, whose clean line perfectly suits the pencils. Maguire goes solo with pencils and inks, showing off his trademark talent for animated expressions (click on image to enlarge). Colouring comes courtesy of Rosemary Cheetham and Hi-Fi, and it works for me, with the Gotham sequences being, unsurprisingly, moodier than the Asia-based Power Girl’s. The opening spread is a bit washed-out, mind – a technical problem, or some subtlety in the art that I’m missing? Carlos M Mangual makes the most of said title spread to show off some fun display lettering, before settling down to the rest of the book. I love the vibrancy of the cover, its composition and colouring, though closer examination shows Huntress to be rather the licorice-legged lady. Eat, woman! World’s Finest #6 is a spiffy addition to DC’s mini-genre of ‘Damian vs …’ stories, as well as a useful chapter in the overarcing story of our heroine’s fight to get back home. Recommended. 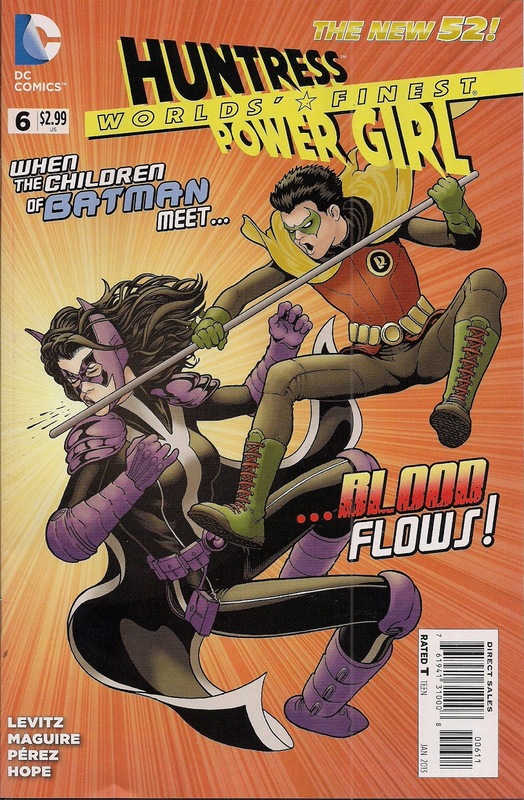 I read that issue, too, today and was intrigued that both Huntress and Robin were aware that they were related somehow but both could not make the final link. The mystery of who is stealing Wayne money weekly is driving this storyline forward and it should be interesting to see Damian's reaction to Helena's life story. Good issue – for a change. I must admit I had rather high hopes for this book, and it started well enough. But since then it all kind of stalled, with PG and Huntress off plundering funds in order to stay on this alt-Earth whilst this underlying menace carries on with hardly anyone noticing. But this issue wasnt bad. Helena has a more feisty attitude here and she suits this Robin love/hate duality with aplomb. And extra surprise…the main plot actually gets advanced! Kevin Maguire's faces are oddly figured tho – everyone seems to be whistling or chewing, thats how he draws. And to me his art is strangely at odds with Perez's classic style. I find the two art styles take me 'out' of the story at times. Any theories on who's nicking the cash, Anonymous? I do hope it's not Kara – not that I'm comfortable with Helena stealing, alternate-Earth dad or no alternate-Earth dad. It's no more acceptable than Superboy robbing a bank in his title. I'm OK with the artistic mix, though I'd prefer Perez and Maguire on alternating arcs, Karl. 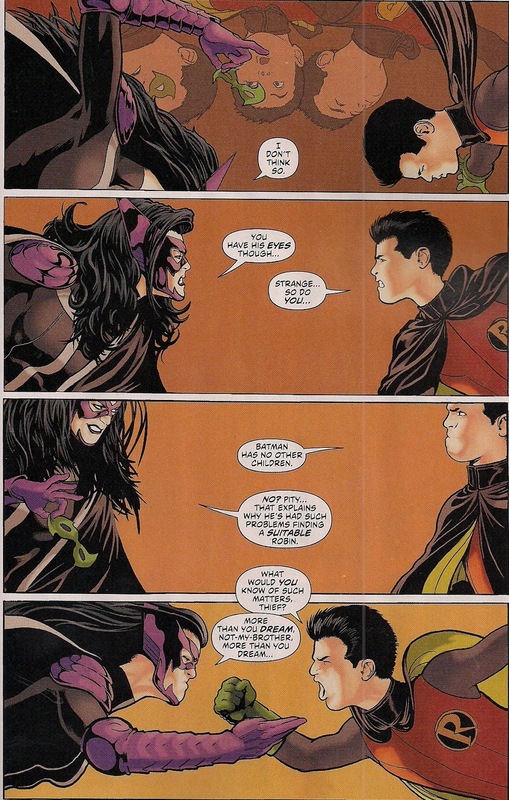 I think the Huntress / Robin fight was the best sequence in this comic so far. Like you Martin, I was surprised that Helena was so open about her criticisms that Robin was wearing her costume – I woulda guessed she was smart enough not to blab that she's from an alternate Earth. But I for one like Maguire's squishy faces – I think they're terribly evocative and I can almost feel the characters' surprise, pain and so on. I realise I'm late to the party in terms of commenting, but I still wanted to comment to let you know that this is one of my favourite titles (I read fairly few, so all of 'em are favorites!) so please do continue to review Worlds' Finest! It's never too late, Rob! 'Squishy faces' – very nicely put!